Here’s a very cool video of a guy who did a time-lapse of his Pacific Crest Trail thru hike. Enjoy. Posted by Kirby Turner on March 28, 2015 in personal. Tagged in hiking. A founder, or maybe the person is a manager type, asked on Quora, “How do you make programmers work 60-80 hours per week?” While the question is a pathetic one, the answers that follow, especially the first one, are worth a read. And you should certainly read the answers if you happen to be one of those sad founders/manager types who wants their of programmers to work long hours. In short, if you are trying to force your programmers to work 60, 80 or more hours per week, then you are doing it wrong. Posted by Kirby Turner on February 21, 2015 in business. Tagged in hiking, indie life, life, long trail, videos. I refuse to accept that winter is over. For instance, today I hiked up Mt. Mansfields to do a snowboard run on Nosedive. And based on the crowd, I wasn’t the only one who thought today was a good day for a hike. Posted by Kirby Turner on May 8, 2014 in personal. Tagged in hiking, snowboarding, stowe. It’s official. It’s really going to happen. We’re moving to a ski town! We’re moving to Stowe, Vermont, in August. Posted by Kirby Turner on June 5, 2013 in personal. 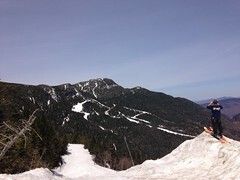 Tagged in family, hiking, snowboarding, stowe, vermont. My southbound hike of the Long Trail didn’t go as planned. I had to stop after 13 days due to a knee injury. As I said in a tweet, “Th-Th-Th-Th-Th…That’s all, folks. I’m not continuing the hike due to constant pain that has zapped all the fun out of the journey.” I’m disappointed that I wasn’t able to hike the trail end to end, but I’m glad I at least tried it. And I will be back next year to complete the remaining 182 miles. Despite not finishing and having to deal with knee pain for weeks that followed leaving the trail, I still look back to my days on the trail and think to myself, “What an amazing experience.” Leaving the trail was a hard thing to do. I struggled with mixed emotions. My heart was into the hike and I wanted to continue. But my brain, and the pain, said it was time to stop. Even after I decided I would not continue the hike, I would stare out at the mountains and daydream about being on the trail. Even now, weeks later, when I see a tree covered mountain I think to myself how great it would be hiking up and over the summit. But a thru hike wasn’t meant to be for me this year. This is not it for me and the Long Trail though. I’m planning to complete my hike next year, and I hope to re-attempt a thru hike again the following year. Also, I want to write up a blog post about my experience hiking the first 90 miles of the Long Trail from the Canadian border to Jonesville, Vermont. I hope to do this within the next week or so, but I also need to finish writing the second edition of my iPad book. Time will tell if I actually write the blog post. Meanwhile, enjoy the pictures I took during my journey. Posted by Kirby Turner on September 25, 2012 in personal. Tagged in camping, hiking, long trail, travel. I decided to weigh every item going with me on my end-to-end hike of the Long Trail. I’m unfortunately carrying about 5 pounds more than I was hoping, but I remind myself this is a month long hike, not a 3 to 5 day trip. I can do without some gear, such as the Solio charger, on shorter trips. Posted by Kirby Turner on August 21, 2012 in personal. Tagged in camping, hiking, long trail, travel. With only 5 days left before I start my hike, I spent the day packing and unpacking my backpack. To my surprise, every thing fit. But also to my surprise, the unofficial total weight is 45 pounds. This includes food and water. I was hoping my total weight would be 5 to 10 pounds less. Posted by Kirby Turner on August 18, 2012 in personal. Tagged in camping, hiking, long trail, travel. One week from today, on August 23, I start a month long journey to hike the Long Trail from end to end. I plan to start at the Vermont-Canadian border, and hike south to North Adams, Massachusetts. I’m not exactly sure how long the hike will take me, but it should be somewhere between 25 and 35 days depending on my daily mood, how much or little I hike each day, and so on. Posted by Kirby Turner on August 16, 2012 in personal. Tagged in camping, hiking, long trail, travel. The other day I mentioned I made a pot cozy for my cooking mug. Today I decided to test it by cooking up a box of Kraft Macaroni & Cheese. I’m happy to report the test was a success. Posted by Kirby Turner on August 10, 2012 in personal. Tagged in camping, diy, hiking. I’m preparing to take a long distance hike in a few weeks (more details on that coming soon), so I’ve been researching different ways to reduce the amount of fuel I need for cooking. I came around this neat posting that explains how to make an backpacking pot cozy. It sounds like a neat idea, and perfect for me since I plan to eat a lot of Mac-n-Cheese on the hike. So I took a stab at making my own pot cozy for my Snow Peak Trek 700 titanium mug. I’m happy with the end results, but I have yet to test the cozy to see how effective it is. That will be my next project later this week. Posted by Kirby Turner on July 30, 2012 in personal. Tagged in camping, diy, hiking. Posted by Kirby Turner on December 19, 2009 in personal. Tagged in hiking, long trail, pictures. Last month Shawn and I hiked Division 1 of the Long Trail. The hike was mostly enjoyable - we had to cut the trip short which meant hiking in the dark with pouring rain and high winds. That part was not enjoyable. But the trail is clearly marked making the night hike easier than expect. Here are pictures from the trip. If I have more time in the near future I will blog more about the trip. Posted by Kirby Turner on November 11, 2008 in personal. Tagged in hiking, long trail, pictures.